Chicken sandwiches finally are being let into the burger bar "club." That acceptance is shown in chicken beginning to get the extravagant builds that previously was reserved for beef burgers. Chicken sandwiches (chicken breasts, as opposed to ground-chicken burgers) have been on burger bar menus for years. Researcher Mintel says 2010 was the tipping point when chicken sandwiches passed burgers in QSR menu appearances. But while burger bars have been seeking to outdo each other with multi-ingredient toppings on beef or other red-meat burgers, chicken sandwiches have had to make do with lettuce, tomato and mayo. Maybe they get a pickle. The QSR burger chains remain reluctant to overdress chicken. Look at Sonic Drive-In's new $5.99 Classic Ultimate Chicken Sandwich: "all white meat chicken breast lightly fried to a golden crunchy perfection, topped with creamy mayo, crisp lettuce and ripe tomatoes all on a bakery quality brioche bun." Jack in the Box describes its new Homestyle Chicken Club as "Southern-Style breaded crispy and juicy all-white-meat chicken fillet with creamy ranch sauce, grilled hickory smoked bacon slices, fresh leaf lettuce, sliced tomatoes with melting cheese all on a soft and airy, perfectly toasty gourmet bun." But many independent burger bars and small chains are dreaming up chicken sandwiches and chicken burgers that rival the culinary inventiveness of the beef burger creations on their menus. That's an evolving shift in thinking and a welcome one. Compare Sonic's chicken sandwich with this build from Baldwin Street Burger in Whitby, Ont. : "Ancho-pepper-lime marinated and grilled chicken breast, honey-lime sour cream, chipotle aïoli, lettuce, guacamole and pico de gallo. Some thought has been put into that sandwich. You want dramatic? Gaze on the O.M.G. Chicken Sandwich (above) at Holy Cow Del Rey in Alexandria. 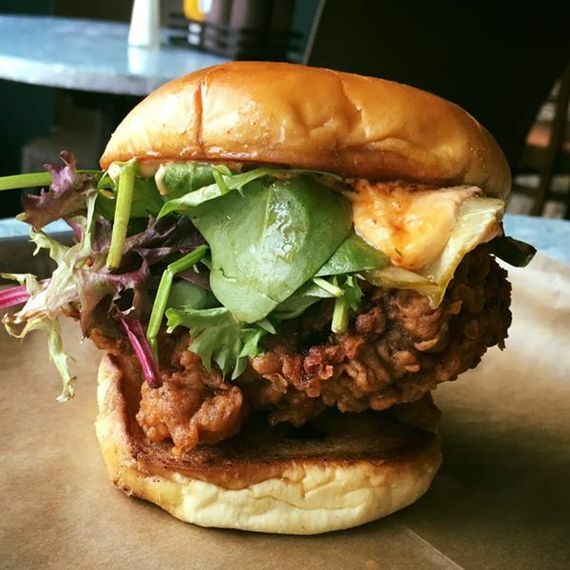 This behemoth puts together buttermilk-marinated fried chicken, hot sauce aïoli, chipotle honey, house-made pickles and mixed greens on a butter-toasted brioche roll. 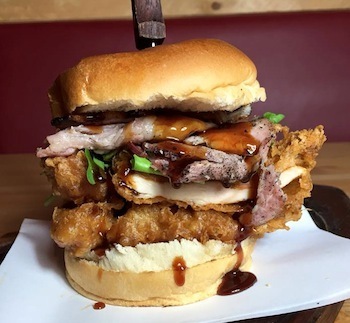 Smokehouse in Leeds, England, has been featuring a sandwich it calls the Dirty Chic (below): Battered and fried chicken breast with smoky bacon and house-made Dirty BBQ sauce. Chicken is well suited to Asian and South Asian flavors. The Burger Point in Chicago this month features "The Saigon Jonny," a chicken burger with house-made Asian sauce, sliced cucumber and jalapeňos, cilantro, sriracha aïoli and soy sauce on a brioche roll. Stuft: A Burger Bar in Windsor, Colo., has a Balsamic Chicken sandwich with fried pepperoncini, Swiss Cheese, red onion, balsamic glaze, spinach, tomatoes and mint chiffonade. For last weekend's brunch, Rok BRGR in Miami menued sliders made with curry-infused ground organic chicken breast topped with a house-made mango chutney and creamy Brie cheese. Seattle's Blue Moon Burgers' Burger of the Month for January is a Chicken Parm: chicken lightly coated with garlic focaccia breadcrumbs, fried and topped with house marinara and Parmesan cheese on lettuce in a grilled ciabatta bun. This is attention and imagination burger bars didn't always give chicken. This shift in thinking about chicken likely is in part a legacy of last year's beef price hikes, which resulted in an influx of chicken sandwiches, each of which needed differentiation. Chicken is throwing off its second-class status at burger bars with builds such as those coming onto menus now.